As recently as five years ago, companies could debate whether or not to use contract management software. That’s not the case today. Instead, the question has shifted to which contract management software should your business implement. Modern contract management software can shorten sales cycles, reduce legal headaches, and increase transparency. However, it’s important that companies are well-informed on which platform to select and how to fully utilize this powerful software. In this article, you will learn how to spot a truly modern contract management platform, equipped with the features a business needs to succeed in the digital age. We’ll discuss the key features and benefits of this popular software category, and help you understand how to find the best solution for your organization. 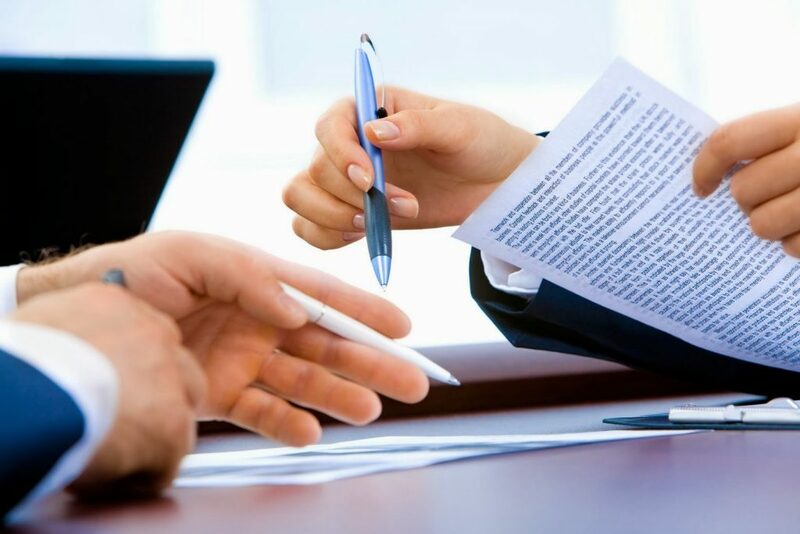 Contracts are a primary factor when it comes to doing business with ease. Whether you’re closing a six-figure sales deal, hiring a new employee, or entering into a business development partnership, there will always be a contract. The continued presence of contracts at the heart of your business means the continued reality of a back-and-forth negotiation between parties. Obsolete contract management entails multiple people, creating multiple versions of contracts that are hard to manage and increase the risk of disclosing confidential information through internal comments. The old way of managing contracts also provided very limited visibility into when a person needed to take action. For example, contract expiration and renewal dates pass without notice, leading to losses for a company and their partners. These outdated processes are disorganized, slow, and create a poor experience for everyone involved. Modern contract management software, on the other hand, automates much of this process, allowing business people to quickly draft, edit, and track contracts through the various steps of negotiation, approval and renewal. In other words, contracts must be user-aware, helping all users to find information quickly and easily. Modern contract management systems have numerous features that save business managers time and money, and improve the user experience for all parties. When evaluating options, look for end-to-end contract lifecycle management, seamless negotiation and collaboration, and detailed analytics. These features will allow you to draft, edit, and track contracts, from inception to execution, in a fraction of the usual time. In addition, the best contract management systems will uncover bottlenecks, helping to improve your business operations. In the absence of software, businesses typically turn to Microsoft Word and email to handle their legal engagements. Furthermore, nuanced contracts are no longer reserved for outside legal counsel or legal departments. Teams as diverse as sales, marketing, customer support, finance, and human resources send and receive contracts on a weekly basis. A true end-to-end contract management solution tracks contracts throughout their entire lifecycle, with a particular focus on how the user interacts with the software and how easy the system is to use. 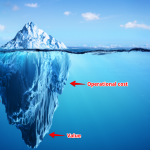 The best software platforms “show the critical importance” on focusing on end users and solving the “perceptions that contracts are either impossibly complex or irrelevant” to them (IACCM-Capgemini Automation Report). What does end-to-end contract management automation look like? An end-to-end contract management system builds on the tools you already know how to use. The center of the product is the contract itself, which is presented in a familiar fashion. Contract “stages” are clearly defined, so everyone on the team will know if a contract is a draft, in review, or already sent to the counter party. Contract management software automates the bulk of the work, from version control and comments to eSignature. These features save time and free employees to focus on higher-value activities. 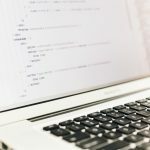 Negotiations and deals are inherently a human process, and cutting-edge software platforms greatly enhance this ability. They allow people to pull up the relevant information from anywhere, at any time. These software platforms increase productivity, help mitigate contract delays, and reduce the amount of administrative tasks for your team. Look for a platform that automates the contract process from end-to-end. For example, integrations with cloud storage providers or customer relationship management (CRM) systems can help you service a customer better once the contract is signed and accepted. A streamlined contracting process has a direct impact on profitability. If a company implements contract automation, they can close sales contracts faster and get to fulfillment faster. 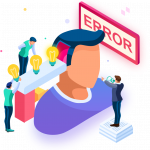 In addition, they can manage customer handoffs with greater transparency and accuracy (for example, between sales representatives and sales manager, or between customer and fulfillment) creating fewer mistakes in the customer management process. At the end of the day, better contract management leads to happier customers, faster payments and increased profitability. We have all seen the firsthand benefits of smart collaboration when using products like G Suite, Slack, and Dropbox. Team members can now collaborate remotely and work on the same version of a file at the same time or asynchronously. Gone are the days of saving endless copies of a document to your desktop! The same benefits exist when transitioning from a manual to automated contracting process. Getting a contract signed and a transaction completed often requires buy-in from different teams, departments, and decision-makers. Being able to see real-time edits and comments on a document dramatically changes the equation. In addition, modern contract management software allows users to access files on their mobile devices. What does smart collaboration look like? Smart collaboration exists because of the rise of cloud-based software. In fact, 90% of today’s contract management software platforms are cloud-based (IACCM-Capgemini Automation Report). 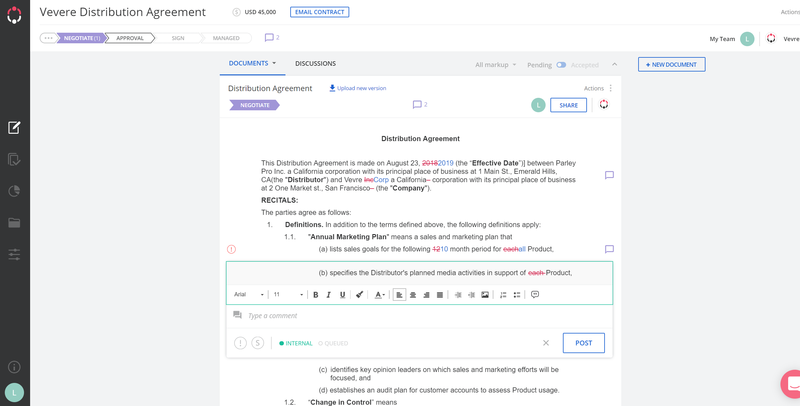 Smart collaboration enables team members to seamlessly make edits across a single document, receive suggestions from others, determine the value of a contract, and check which stage of the process a contract is currently in. There are a fixed number of hours in a day and a seemingly endless number of tasks that need to get done. The right contract management solution allows your team to focus on resolving the highest priority issues. For example, your team may have multiple contracts that have comments and redline edits. With smart collaboration, stakeholders can quickly identify and understand high-priority items, work on the latest version, and resolve issues to quickly execute the final contract This quick turnaround means deals close faster. Look for a contract management solution that uses intelligent workflows and enables precise control over contracting milestones. The system should always alert users as to the specific stage of the contract, and what needs to happen next, thereby reducing bottlenecks. 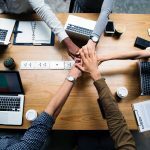 Moreover, look for a solution that not only lets your team members collaborate on the document and write comments, but also communicates which issues are high-priority, standard-priority, and helps resolve any outstanding issues. Smart collaboration can shave days off the contracting process. Real-time collaboration speeds up both the internal review process and the negotiations with the counter party, whether that’s with a vendor, partner, or customer. Specifically, as an organization increasingly relies on external vendors, the ability to collaborate with individuals and teams across geographies and time zones becomes crucial to staying productive. Today, few contracts are assessed after the fact. Many organizations take a signed contract and file it away in a manilla folder – where it will sit for the rest of its life. 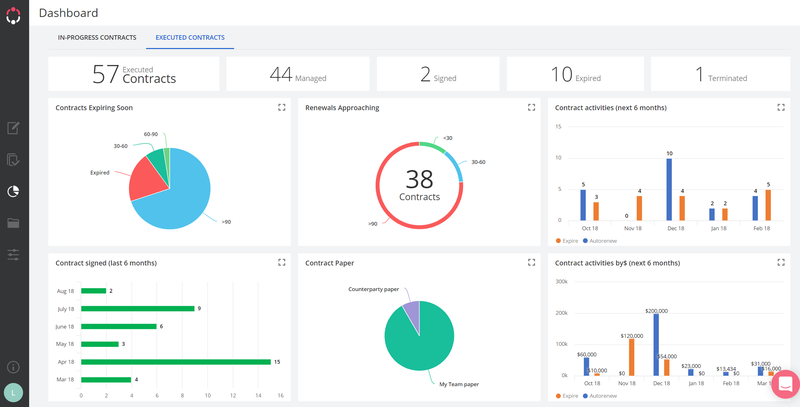 Modern contract management platforms offer tools and real-time analytics that track key metrics and KPIs across all stages of the contract lifecycle. 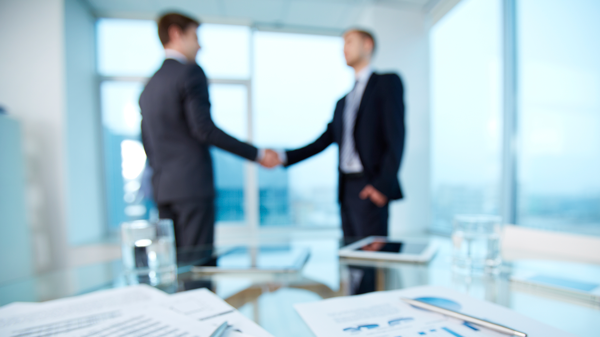 You can easily identify which contracts are in the process of negotiation or ones that have already fully executed. You should be able to see that the contract needs to be renewed or renegotiated because they’ve expired or are no longer relevant to your business. For instance, you may see that contracts slow down at a particular clause, or that two-thirds of your clients redline the same section, creating avoidable bottlenecks. These are all huge opportunities to extract data, insights, and operational value from contracts. What do reliable contract analytics look like? Software platforms are often focused on security, access controls, and compliance. 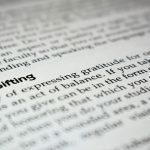 While these are important considerations, more attention needs to be paid to extracting business value from the information within a contract (or within the contract process itself). Having detailed contract analytics empowers your team to reduce risk, increase efficiency and value through data-driven decisions and optimize your business’s financial performance. Has a particular contract been stuck in the same status for weeks? How is Salesperson “A” performing against Salesperson “B”? Does the same section of your partnership agreement get flagged by potential partners? Are potential customers confused by your pricing structure? Having access to contract analytics would give you the answer to these questions and many more. Select a contract management software platform that comes with actionable, interactive dashboards. The best systems will provide a list of KPIs for you to track and the ability to click-through to get a more granular look at the underlying data. Contract management software will help you meet deadlines, understand trends in your contracting practice, and optimize your legal terms and business operations to maximize profitability. As MC McBain of IBM said, through business analytics, companies “will learn better how to gauge the characteristics needed for a good relationship” and “how to understand client preferences, business needs and the terms they value” (IACCM, The Future of Contracting). As you now know, for most businesses – whether they rely on vendors, suppliers, customers, or partners – contracts are the lifeblood of their business. After reading more about contract management software and the inherent benefits, you should be better prepared to find and implement a modern solution that fits your business needs. Get started today with a contract management solution that can increase your profitability, schedule a free demo with Parley Pro. All things marketing at Parley Pro.